Name: Skimmia japonica – commonly called (what a surprise) Japanese Skimmia. Males! 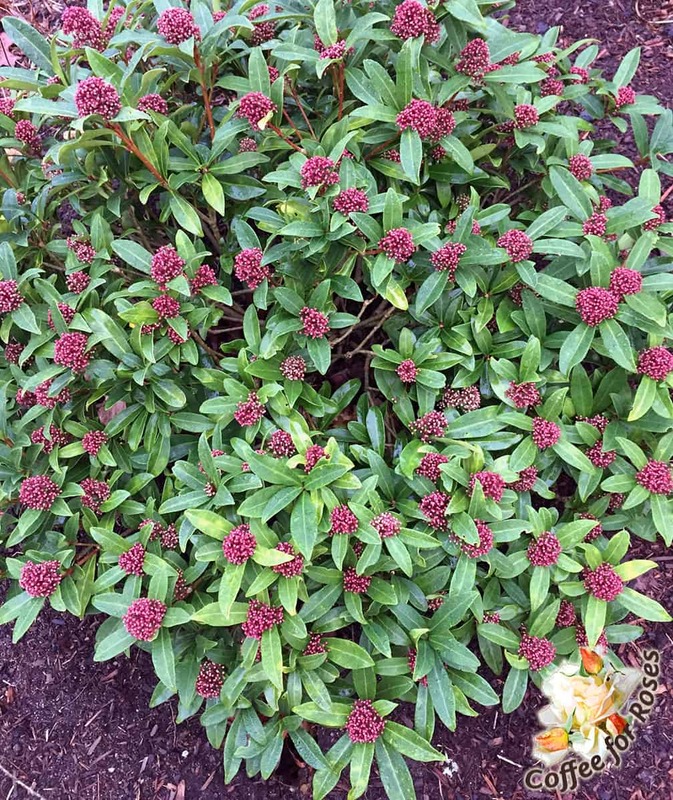 Type of Plant: Short, evergreen shrub that’s hardy in Zones 6-8. These plants do best in part shade, and grow to about 3 feet tall and 4 feet wide. They are not particularly fast growers, however. Why I Love This: Why am I highlighting the males? Because they are in flower for most of the winter and into spring. The flower buds appear in November and are a pinkish-red through the winter months. Once they open in the spring the flowers are creamy white and a bit fragrant. Although both males and females flower, of course, the males have larger blooms and seem to be more showy for a longer time. The male plants are also tighter and stay a bit smaller than the females…the opposite of the blue hollies where the males grow wider and more open. A Word to the Wise: Don’t place these shrubs in full sun, and be sure that you have good drainage. If you have a front door or foundation planting in part to full shade, you might want to consider planting male skimmia there. These flowers will make you smile all winter!